Looking for a vasculitis or wegener's doctor. I've searched the Alberta docs and have found a couple of potential doctors who seem very very nice and interested in this nutty disease. I will follow up on Monday to see if they are taking any new patients. Cross your fingers for me, better yet, if you know of someone pass their info on to me. Gracias Amigos. Hi Marta, I'm sorry to say I've been busy and haven't been able to check in on your blog for a couple of days. When I read about your immediate response to the rise in pred-dose I was amazed over the similarities to my own experience, but at the same time I feel sad, because it seems really hard getting a clear message from the medical profession. Where are the guidelines? I fully understand your frustration. It's impossible to know which road to take: Pred-effect (relief) versus insomnia, pred-rage etc... It feels like such a setback either way. 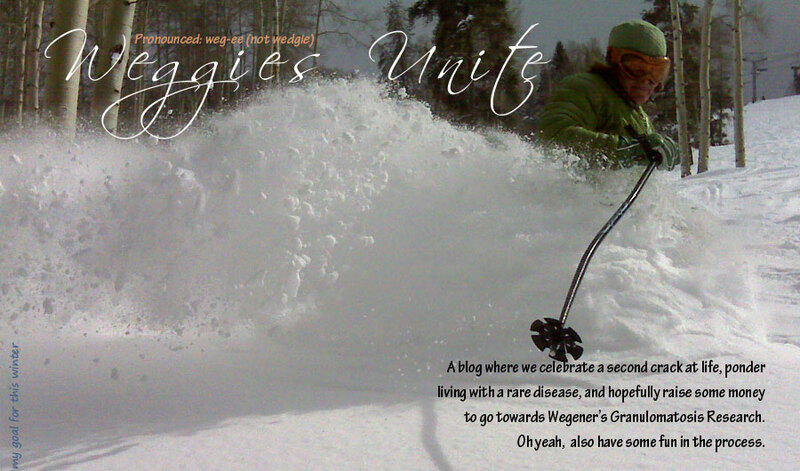 I wish you best of luck in finding a supportive Wegener specialist. I'm convinced that your thorough search will pay off. You have to keep the faith and take one microstep at a time. A little whine with your cheese? Hang on tight. Roller coaster ahead. 12.5 Today - Woot woot!!! "Healing forces are working their mojo"